My very first lager was a beer that I called Brother Bear Dopplebock and brewed back in February of 2010. Of course, this was before I started all-grain brewing. 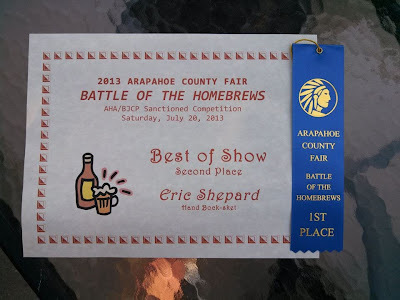 Much more recently, I declared that I was going to try to brew all-grain batches in all the BJCP Categories that I have not brewed in (see SheppyBrew Styles). Category 5 Bock was one of those missing styles because I had not brewed an all-grain version. Brewed yesterday. Everything went great. 1.069 into the ferment or. Pitched at about 44. Pretty much done. Kraussen gone. Starting to clear up. I may keg it this weekend. Kegged Sunday. 1.014 FG puts this at 7.3% ABV. Sample was delicious. Leaving at room temperature for now. Really looking forward to drinking in May. Had a little taste. Even warm this is tasting good. I will probably wait for Spring Forward to carb before I put this in the beer fridge to start chilling. Gave the keg a shot of CO2 and put into the beer fridge. Chilling now for about 3 weeks. Not May yet,but I poured a glass. Needs carbing, but tastes great. Bready and balanced. Nice Munich malt flavor. Not as clear as I'd like, but that's ok. It is delicious. Rich bready Munich malt flavor. Just enough hop bitterness to balance out the malt sweetness. Great beer to enjoy with a sunny, snow-melting Spring day. #WillDrinkInMay the problem with this beer is that I treat it like a session beer. It isn't. Still drinking in June. Still delicious. Very clear now. Almost done. Getting some yeast in the pour now. Still a yummy beer.